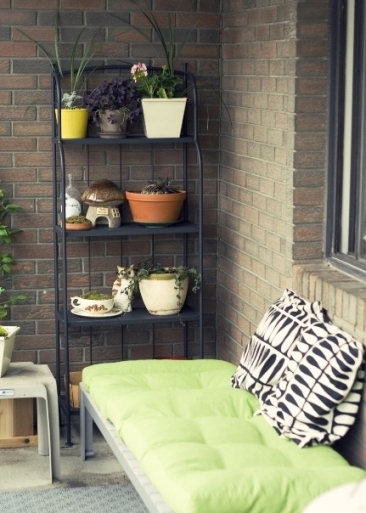 There are countless forms and styles of decoration for your balcony or terrace with little money and a lot of imagination; these are some ideas that can help you. 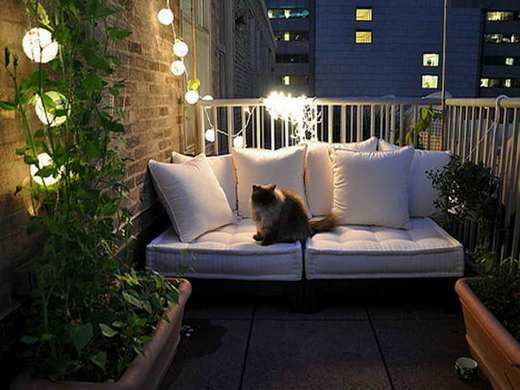 To design your balcony, there are several ways to do it easily using and playing with textiles, add some accessories and even plants in pots with your favorite flowers. Usually there are always a lot of wasted spaces, and you can make the most of it by means of optimum furniture for the organization of the space. Shelves or racks are perfect for these places. Inside you can place infinity of objects or decorative elements, accessories for the exterior like illumination. You will gain space and in a very short time for installation. To save space, you can put pots on the same railing of the multitude of pots and beautiful flower pots that are available in the stores or you can even decorate by hand with paint yourself. It will also help you put seasonal flowers; you will achieve that last longer and look better than any other flower that is not seasonal. Thus, in summer you can enjoy a more fresh and natural environment with flowers and plants. Add colorful fabrics, varied and resistant to the sun. Ask what color range you want to dominate your balcony or terrace and bet on cushions and mats on chairs and stools. The goal is to make your outdoor place a comfortable place to relax in the sun or an afternoon of coffee. The corners are often the most wasted places. With imagination and creativity multiply its functionality by adding benches and corner tables to help you expand the possibilities of your terrace to make out even better than indoors. The novelty of these past dates, there are the garlands. You can also make garlands of lights to decorate your environment in the best possible way. Almost all the terraces now have their strips of lights and almost all are powered by solar plates that collect energy directly and economically from the sun. If you want a more functional and practical lighting than just aesthetic, do tests to combine power lighting and better equipped units, because many solar models are not sufficient even to illuminate a dinner as you expect. The ability to decorate, illuminate, inspire and romanticize a space of good candles in a retro lantern is a fashion that is booming. In addition, there is a wide variety of aromatic candles with very useful functions, such as scare the mosquitoes and other insects from your intimate gatherings. Do you like to feel the lawn, even if it is artificial? Or do you prefer the touch of wood? Placing a material that you like best on the floor of your terrace is a great idea and can be very economical and decorative.